How many people use the mind mapping technique to help them use the Method of Loci better? Not as many people as I would like! Worse, some people struggle unnecessarily with how to find Memory Palaces. They know they need many of them in order to get the Method of Loci operating properly, but they struggle to find enough of them. Let’s put an end to this struggle right now. On this page you’ll discover how they can work together to help you create dozens, if not hundreds of Memory Palaces by creating a simple Mind Map. If you’re anything like me, there’s only one frustration that comes with learning a new skill. You want things to be perfect… instantly! Well, let me caution you that using mind mapping to help you benefit from the Method of Loci is NOT for perfectionists. Be willing to drop your perfectionism and progress towards consistently becoming better. Bring your flexibility, your willingness to “just do it,” and joyously make mistakes for the purpose of growth. Mind mapping is not a final destination, a journey from point A to point B. Instead, it is like a brain cell on paper, with multiple tributaries that radiate outwards from a central point. It’s kind of like how rivers flow from lakes out into the oceans. In other words, mind mapping is organic. And the process is not a linear race to some end point. Rather, it is a process and a journey – not unlike the “journey method” of the method of loci itself. Except, in this case, we’re “unlocking” as many journeys as we can assisted by mind mapping. Understanding this concept is the first step to success. Then understand the process. Because as a lifelong learner, you will always be stepping into an unknown future. But if you have a hyped-up destination in mind based on bankrupt ideas about how your brain works, you’re just begging for frustration. Indeed, you’ll be paralyzed by inaction before you can even begin. Take a deep breath. Put pen to paper. 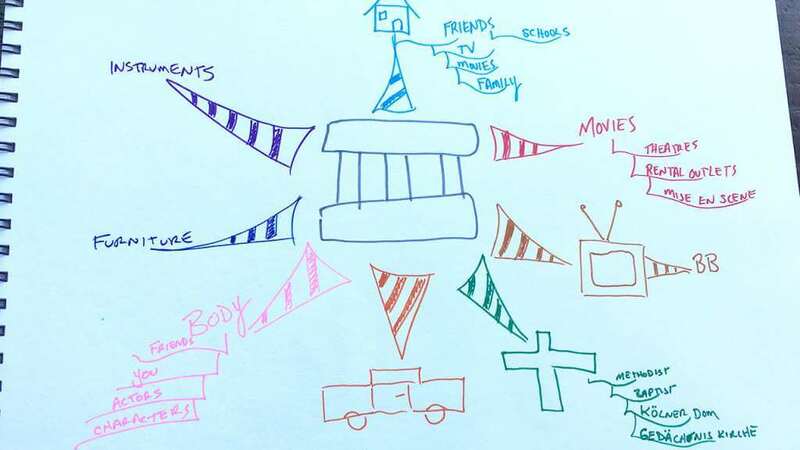 The starting point to creating an effective mind map, as taught by Tony Buzan in Mind Map Mastery is to have a large central image that uses at least three colors. This central image should be inviting, one you’ll want to revisit. You don’t have to be a great artist. Once again, don’t overthink it! Let your mind wander as you draw, but wander in a focused way. 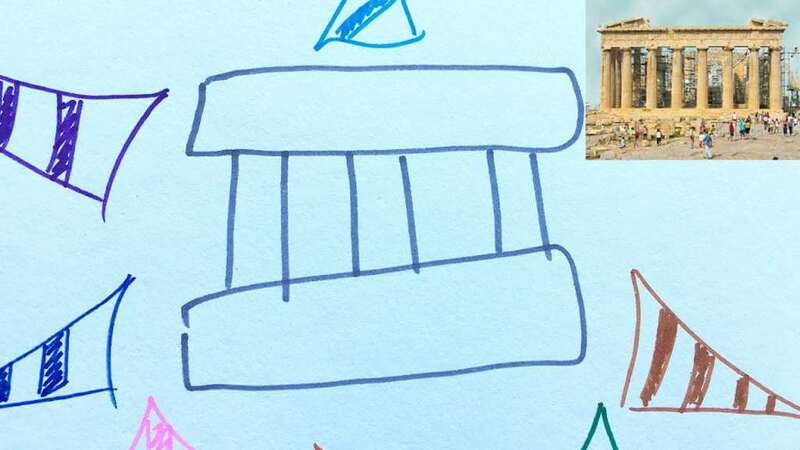 To mind map the Method of Loci, for example, our central image could be a Parthenon-esque column to represent the origin of this incredible mnemonic device. I chose the Parthenon due to an association with Simonides of Ceos and stories that link the origin of the Memory Palace with ancient Greece. But you might choose something else, perhaps from even earlier in history based on Lynne Kelly’s discoveries about this technique in The Memory Code. From that central image, we travel outward by creating a radiating tributary. Where do you spend a majority of your time? What surroundings are most familiar? What environment is the most recognizable? For most people, the answer is home. Whether you list your childhood home, college dormitory, a beloved first apartment, or your current residence, “home” is a place that you know frontwards and backwards, inside and out. List every “home” that comes to mind. This choice already opens up so many possibilities for multiple Memory Palaces, doesn’t it? Don’t worry. This is just the beginning of the ideas I’ll share on this page. But it will help you even further if you understand why this process is so valuable to your progress. Think of your brain as a garden. You have this rich soil (your brain cells). Let’s say that about 10-20% of that soil is involved in your spatial mapping and spatial memory abilities. Well, without “excavating” more Memory Palaces from the soil of your mind, you’ll never have enough rows to plant seeds of memory using association-based mnemonics. But when you get this right, you’ll have multiple perfectly tended rows to load full of seeds that will eventually create an incredible harvest every time you wish to remember new information. Consider the remaining blank space on the page with your mind map. What other homes are you familiar with? What about homes of fictional characters? Aren’t we all familiar with Monica’s iconic apartment on Friends? What about the Addams’ mansion, or the lush greenery of The Shire, home of Frodo Baggins and Samwise Gamgee from Lord of the Rings? Relax, extend, and cultivate to expand your mind map. Then think about schools, movie theaters, video rental outlets and even think about how to increase memory by watching movies and TV series. The possibilities are endless for exploration. Once you realize this fact, mind mapping lends itself to a natural flow. The only warning I have is that you might need additional training so you know how to enhance your memory with Virtual Memory Palaces properly. Once that flow has been created, get out of your own way. Given about seven hours a day, Monday through Friday, for over a decade were spent in school, this is another familiar place that can lend itself to a branch on your mind map. Then there are churches, libraries, movie theaters. These are all big, grand, familiar places from which we can expand our web. All of these places have specific areas inside of them, details that you can, and should, allow your mind to explore, and revisit. Then use a central image and let the ideas flow. As you relax into the process, the combination of keywords and images will trigger memories. For example, in your elementary school there was likely a playground, gymnasium, library, and cafeteria. Thinking of your library may lend itself to thinking of your favorite books, then favorite authors, or favorite movies that were adaptations of those books. Exploring the idea of your cafeteria may lead you down a path of your favorite lunch day, or a memory of your Batman lunchbox. Where does that notion of the Batman lunchbox lead? Perhaps back to the early television series with Adam West, then back to a notable “home,” the Bat Cave. You can also use cars. I have four that I use – the same four that I drove during high school and early university. Just reflect back through all the cars you’ve owned. 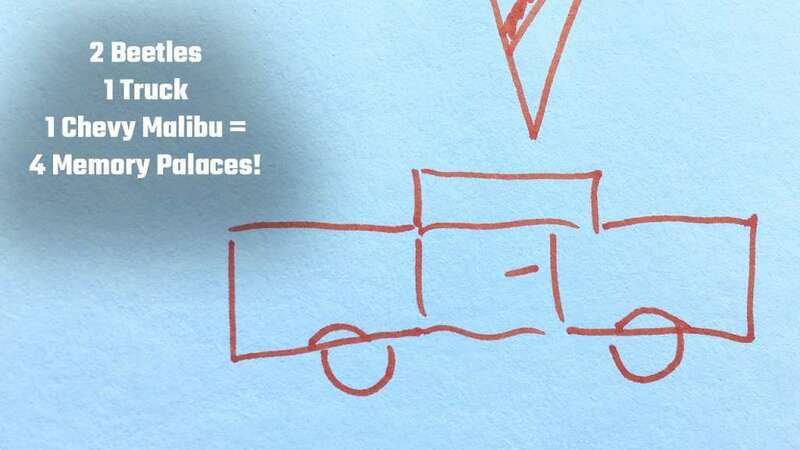 You could also add cars your family members and friends have owned and potentially cars from movies that stand out in your imagination. Use these places, these ideas that seemingly come at random and record them onto a mind map, taking note of how they weave together. It’s just part of how to study fast. Fun, isn’t it? 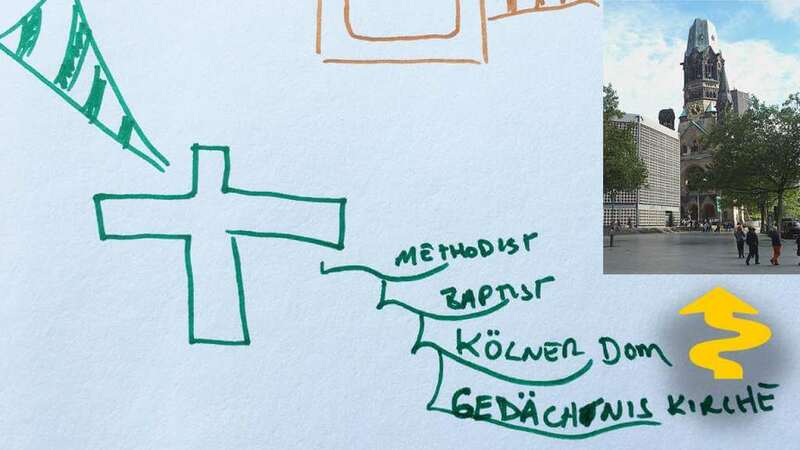 For example, I drew a simple cross to represent the idea of a “church.” This instantly led me to think of churches I’d been to as a kid and that I’d visited while living in Europe. As luck would have it, the Kaiser Wilhem Memorial Church in Berlin (Gedächniskirche) leapt to mind. It’s a powerful Memory Palace! With more practice, you’ll see that these ideas aren’t random at all. 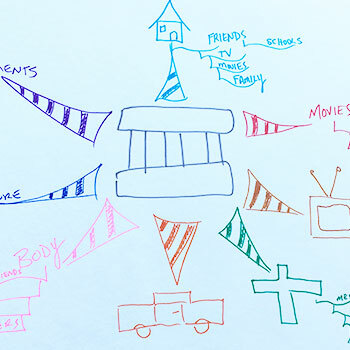 The mind mapping technique is helping you make better associations that lead to more familiar and powerful Memory Palace options. Yes, you can use your body as a Memory Palace. Your guitar, your sofa, anything goes. Get out a large piece of paper. Create a central image that represents the goal: Identifying multiple Memory Palaces for developing your method of loci skills. Understand that the tributaries “radiate” outwards. Allow these tributaries to radiate further (i.e. 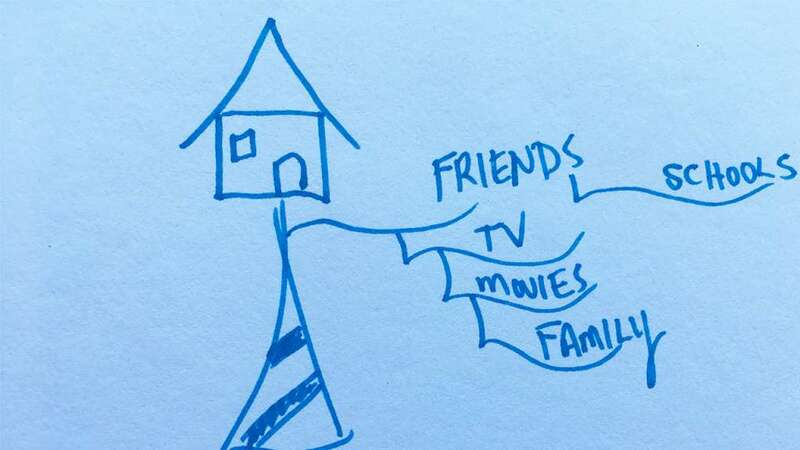 from “home” to the homes of your friends, family and even fictional characters. Use both keywords and simple drawings. Relax before you get started. Focus on progress, not perfectionism. Draw each Memory Palace you identify. Use the Memory Palaces as soon as possible. Come back to mind mapping to find more Memory Palaces and get more out of the method of loci technique. In sum, this amounts to seven categories and dozens of potential Memory Palaces. There is more stored in your mind than you might realize. Use mind mapping to tap into it. It’s all there. Waiting to be retrieved. Waiting to be used. Your brain really is the mind map template you’re looking for. 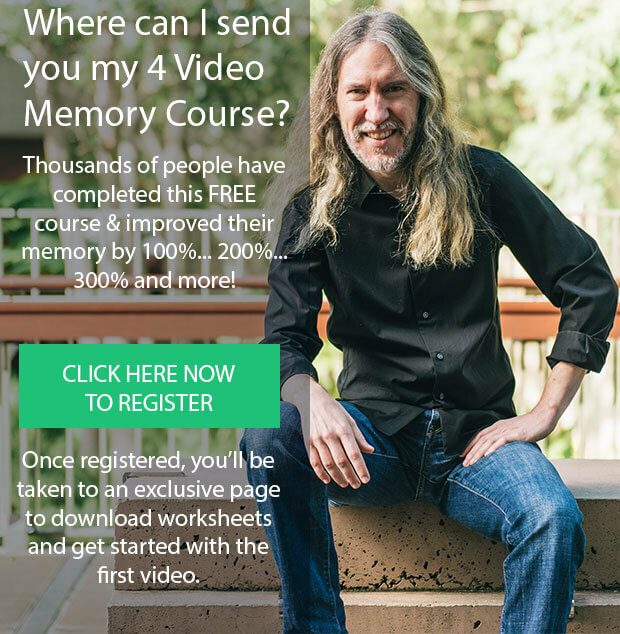 You just need to exercise this powerful memory technique so you can use all other memory methods better. 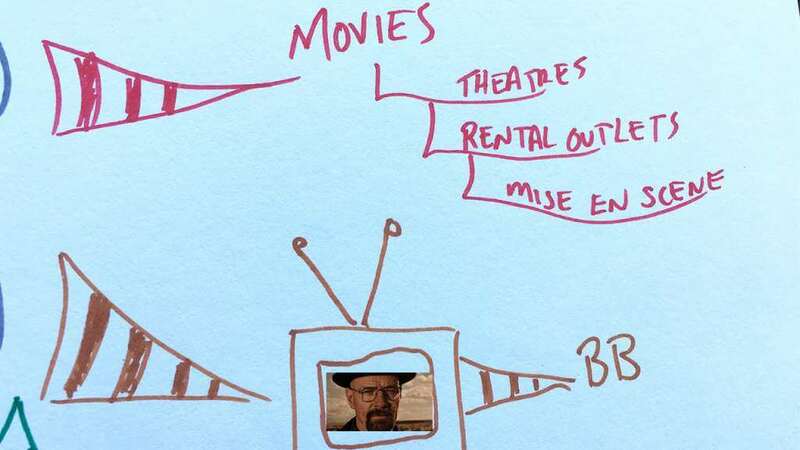 Let mind mapping help you bravely tap into your creativity and revitalize your memory. But your journey doesn’t stop there! To fully utilize these Memory Palaces mind mapping has helped you identify, use them a.s.a.p to store the information that’s important to you. Need more? Check out these 5 Memory Palace Examples To Improve Your Memory Training Practice. Enjoy the process as a practice to use again and again for life! This blog post was originally created on a live stream with help from the Magnetic Memory Method Audience. The post 7 Powerful Mind Mapping Examples For Better Method of Loci Success appeared first on Magnetic Memory Method - How to Memorize With A Memory Palace.